This morning I woke up with an icy nose, a sure sign that autumn has actually arrived in my neighborhood. It's the start of the long slow descent into winter and all it brings with it: Thanksgiving with it's brown food and tradition (my favorite holiday, somehow traitorous for being positioned at the beginning of my least favorite time of year); Christmas with it's festive decorations and holiday lights to fight the dark gloom of Pacific Standard Time; then on to New Year's Eve, always slightly melancholy for me though I can't put my finger on exactly why. The true descent is after that: the cold nights, the gloomy gray days, the calendar refusing to turn it's page into warmth and sun. Around January 15th I start browsing websites for the best airfare to Hawaii, and park myself on that webcam pointed at the beach in Maui, the hypnotic sound of waves lapping on warm shores lulling my chilled self. When I close my eyes I can feel the tropical breeze and sea spray on my face. When I open them I realize it was just the heater vent kicking on mixing with my salty tears of despair. Did I mention I hate the cold? Perhaps I'm not the only one. Although California is known for it's sun and endless summer, those perky songs you've heard were really written about Southern California. Up here in the north, it's not exactly surfing weather all year round. Sure, compared to Montana we're downright tropical, but we've got our share of below freezing nights and cool cloudy days. I feel guilty hoping for warm weather when we could really use the rain. Perhaps if I wished for warm rain? Who am I kidding. I'm screwed. I'm smart enough to realize I need something to look forward to if I'm to survive another winter, so we're in the midst of planning a trip to the desert in February. I think I'll live. 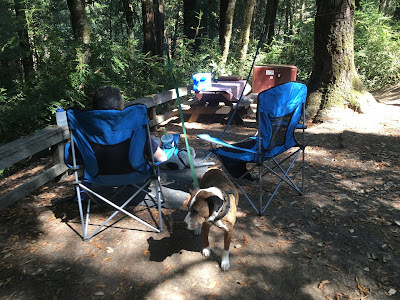 In the meantime, I have memories of a great summer spent camping in the Sierras and an absolutely magical trip up the Oregon coast we took in September. On a summer break during college, I took a trip north with my boyfriend at the time, camping all the way up the coast until we reached Canada. I had such fond memories of that trip (though strangely, none for said boyfriend) that I had always wanted to do it again. Mark was game, so early in September we made it happen. I must say, I had an even better time with Mark (much to his relief). We dubbed it "The 101 Trip" since we'd be traveling Highway 101 the entire way. Our ultimate goal was to reach Tillamook Creamery, one of the fondest of fond memories from my long ago trip. A tour of a creamery with free cheese samples at the end? How can it get any better? 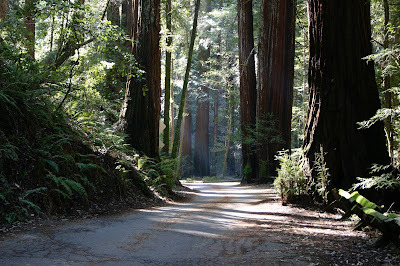 First stop was the Avenue of the Giants, camping in among the tallest trees in the world. 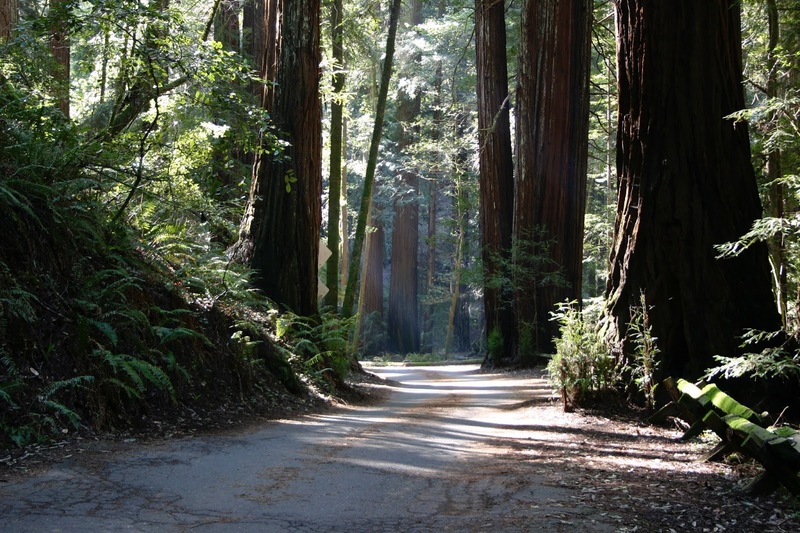 California redwoods are amazing and these trees are some of my first memories as a kid. Standing next to one as big around as the family car, looking up 30 stories to the top waving in the breeze, the trees were almost impossible to comprehend. Most of them were there long before I was born, and they will be there (with any luck) long after I die. There's something assuring about that, knowing they'll be watching over things for us when we no longer can. 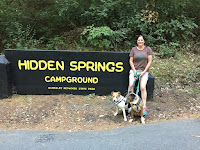 We camped in Hidden Springs Campground in Humboldt Redwoods State Park. 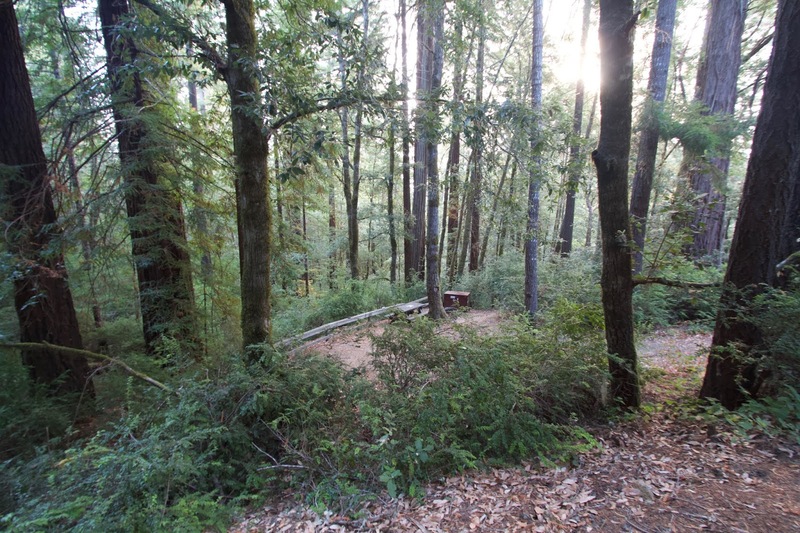 Set along the south fork of the Eel river, it's a beautiful campground with well spaced sites that allow for privacy and quiet camping. It was a great way to start our trip, watching the huge swaying trees above us as we ate dinner. 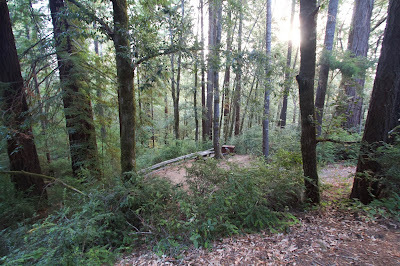 Nothing quite equals a meal prepared on a thick wooden picnic table, eaten while being pelted with redwood needles as they rain down from the above. What bowl of pasta isn't improved by tree bits? 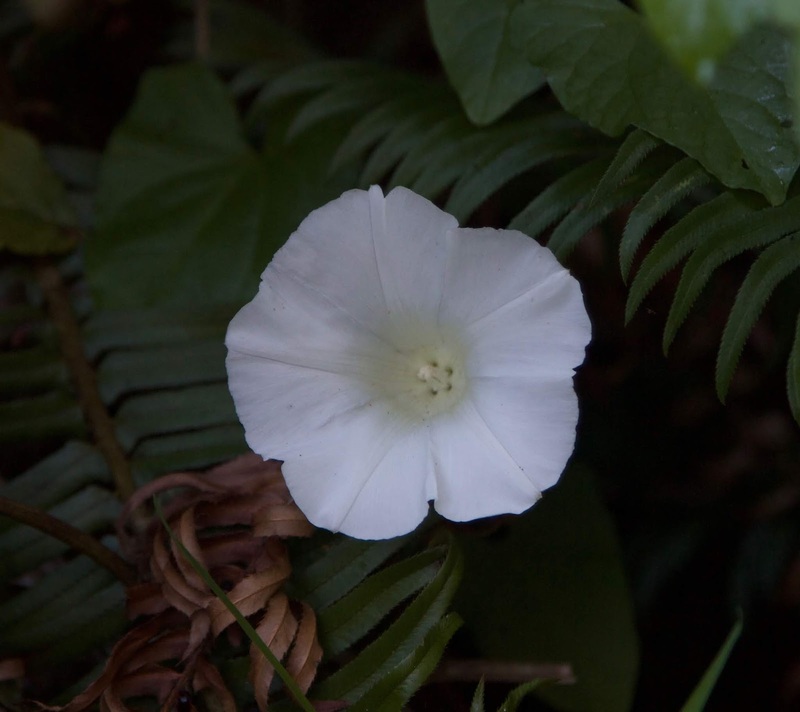 We sat up late that night, squinting up through the narrow gap in the trees trying to spot a satellite passing overhead. One of our traditions, we can't turn in for the night until we've spied one. Our campsite was a short hike down from the road. 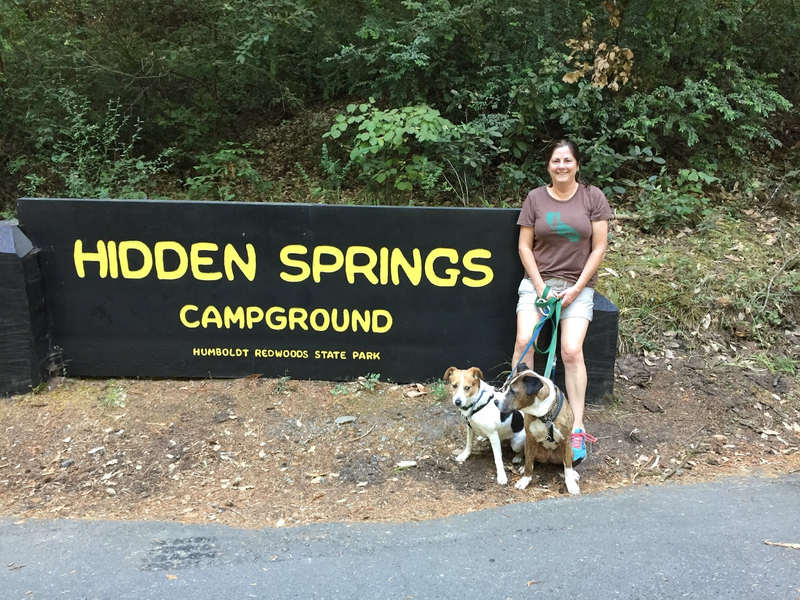 It overlooked a deep ravine filled with trees and chittering squirrels that kept our dogs on alert. 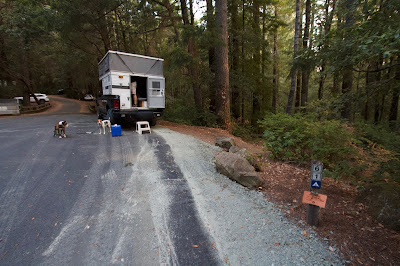 We parked on the road and carried our dining room down to our redwood suite. It was a quiet night. We got up early and went for a run before breaking camp, trying to get a little exercise in before our day of driving. Luckily, the campground had brand new showers right across from our site. A few quarters later we were clean and ready to roll. 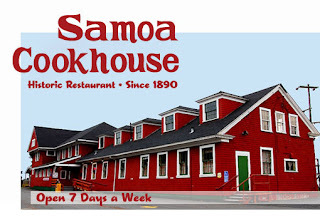 I had always wanted to stop in and eat at the Samoa Cookhouse, the stuff of legends in my family. My dad once took a two day motorcycle trip with the express purpose of having breakfast there. Having passed it by multiple times during my life, I wasn't going to let it happen again. I didn't have trouble convincing Mark; turns out he had the same idea. 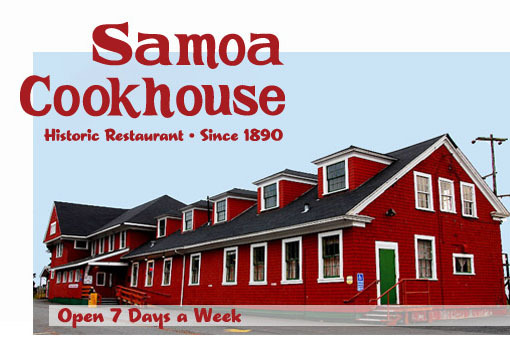 Located on a spit just west of Eureka California, Samoa Cookhouse started as the Hammond Lumber Company cookhouse in the late 1800s, serving the loggers and longshoremen as they systematically chopped down the redwoods and shipped them down to San Francisco and points beyond. The company kitchen served up three hot meals every day but Sunday evenings, when the lumberman got leftovers. If you've ever heard "eat like a lumberjack" you can imagine the size of the servings. When the lumber industry wound down in the 1960s, there was talk of closing the cookhouse. The head cook wouldn't hear of it, and talked the company owner into opening the dining room to the public. It's our great fortune that he did. 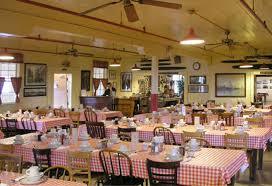 The kitchen has been cranking out these huge meals ever since it opened in 1890, 128 years of caloric history. They have a set menu (and price) for every meal at the Cookhouse. They post it on a white board every day and you can decide if you want it or you can leave, none of those namby-pamby choices found at those hoity-toity restaurants. The food is impressive in quantity as well as quality. 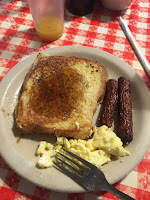 French toast was on the menu that day and I guess they figured out how to make it after 128 years of practice, because we thought it was the best we ever had. Huge slices of house made bread trundled out on a cart with pitchers of maple syrup and a side of sausage and scrambled eggs. Did I mention every breakfast starts with biscuits and sausage gravy? Not ordinarily something I'd order, but hot damn they were good! Everything is washed down with the jug of coffee and orange juice that comes with the meal. By the end, we barely had the energy to push ourselves away from the long communal table. 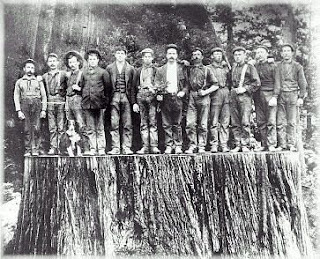 Stuffed to the gills, we tottered into the museum adjoining the dining room and looked with glazed eyes at the tools of the lumber trade hung on the walls and display cases. 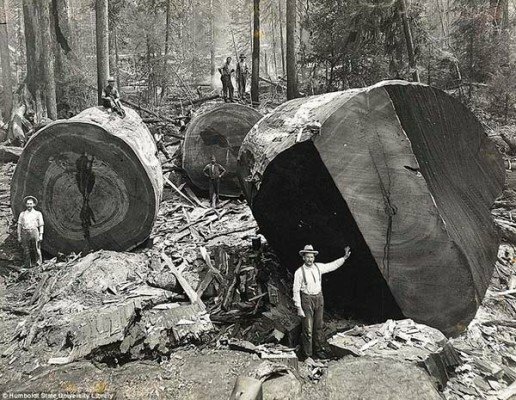 I have no idea how those lumberjacks were able to get back to work after eating like this, but apparently they did with efficiency. There are very few old-growth redwood stands left in the state of California. But onward and upward, we were on our way to Oregon and a little indigestion wasn't going to stop us! Pants a little tighter and cholesterol a bit higher, after several attempts we were able to hoist ourselves into the truck and were on the road again.